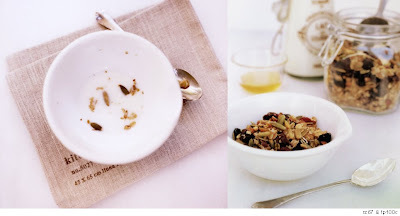 a bowl of granola for breakfast is one of life's simple pleasures. it's one of those things that seems to cost way too much at the market and then you remember just how easy it is to make at home. making it also allows you to clean out your pantry of the various fruit and nut bags that are slowly taking over. as with many of our recipes, feel free to use a combination of whatever you have on hand or whatever flavors you like best. but don't leave out the pepitas! they are roasted & salted pumpkin seeds and are a beautiful green color - they add a delicious sweet & salty element to this granola. whether you like a big bowl filled with milk or a little granola with yogurt and honey, we hope you enjoy some soon. preheat oven to 375 degrees F. roast almonds on a sheet pan for 10-12 minutes or until fragrant and lightly colored. let cool, coarsely chop and set aside. reduce oven to 300 degrees F. on a sheet pan, toss oats with honey and oil and spread into a thin layer. bake 30-35 minutes or until lightly golden, stirring halfway during baking. let cool slightly. in a large bowl, combine chopped almonds, toasted oats and remaining ingredients. store at room temperature in an airtight container. great photography. very clean shots. Yum. I start every morning with granola. What a treat. But I haven't tried it with pepitas in it. A definite must. Lovely photographs. I just had a yogurt-berry-granola "parfait" today...which had me thinking of making granola at home. This is perfect! Your granola sounds wonderful. I have a recipe, but will have to try yours. I hopped over from Simplesong. I'm glad I did. I received a camera over the holidays and have been playing with it. I enjoy taking pics of food (except for todays post I was in a hurry). I'll be back to visit. Have a great weekend! I have a bowl of homemade granola every day - from Monday through Friday with a mild, plain joghurt and fresh fruits, so I don't add dried fruits to my granola. For friends, I always add cranberies or raisins. But: I substituted the canola oil with a mixture of juice, honey and maple syrup... It's interesting to see all the interesting granola recipes - that's lots of inspiration to me. Thanks for sharing.